It’s been a couple of months since I started my lesson series on achieving absolute fretboard mastery, and we’ve covered quite a bit of ground over the last three installments. In today’s lesson, we’re going to touch on an interesting concept that involves combining the minor pentatonic and major pentatonic scales. If you’re new to this series, the things I talk about in this lesson might seem a bit sudden or haphazard. So to get the most out of this lesson, I recommend you check out the last three installments of the series first. So far in this series, we’ve learned to play minor pentatonic and major pentatonic across the fretboard, and if you’ve practiced your meandering, you should be able to visualize these scales across your whole fretboard with ease. Last time, we spoke about adding the blue note into these scales to create the signature blues sound. What we’re going to be doing today is drawing on this knowledge to learn how to combine the minor and major pentatonic scales to create patterns that give us a very unique and interesting sound. What we want to do now is train ourselves to see these two positions together. A little trick that helps to start off this blending process, if you will, is by first looking at the notes on the first and second strings and combining the scales on these two strings. 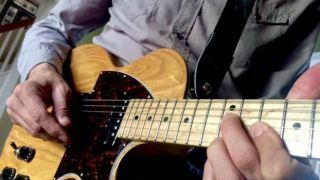 When combining these two scales, what we want to learn is how to phrase our notes to make sure we stick to the more rock and roll or blues-esque pentatonic sound we’re starting off with. Instead of just combining the notes in both scales, think about how we’re going to alternate between these two scales to create the sound we’re after. Start playing around the notes in this pattern and you’ll start to hear how much more unique and interesting it sounds than if we were to just play in minor pentatonic or major pentatonic. When utilizing this concept in your playing, the most important part is knowing when to use major pentatonic, when to use minor pentatonic and when to use this hybrid scale. This is where our old trick of meandering comes in. For this week’s practice, start off by meandering across this new pattern we’ve learned to really get a feel for mixing up the minor and major pentatonic. Another thing I want you to focus on this month is to start adding the essential techniques like hammer-ons, pull-offs, slides, bends and vibrato into your usual meandering. In this example, not only are we combining the major pentatonic and minor pentatonic, but we’re also going from the minor third to the major third of the A chord to create a really cool bluesy rock and roll sound. So the fifth fret note is actually from the minor chord and the sixth fret note is from the major chord. You see, this is the really cool thing about blues and rock and roll. Sometimes things that don’t really make sense logically make sense in rock. Which is why we start off by tackling a lot of concepts in terms of visual shapes as opposed to traditional theory. Until my next installment, I want you to focus on what we’ve covered today and work hard on meandering on this combined scale while incorporating essential techniques like hammer-ons and pull-offs. I also want you to check out a video I did for Guitar World called "Essential Blues Basics: Soloing with the Combined Major and Minor Pentatonic Scales." As always, practice hard, and stay tuned for next month’s installment!